The English graffiti artist has taken his politically charged message to the bombed-out neighborhoods of Gaza, where a series of murals amid a backdrop of devastation attempts to give voice to the desperation felt by Palestinians. 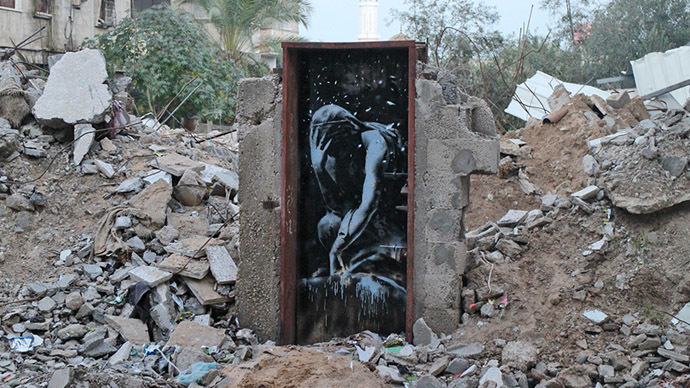 The first mural, entitled “Bomb Damage,” appears to be inspired by Rodin’s famous sculpture “The Thinker.” In Banksy’s version, however, the viewer is struck with the realization that the only possible thing on the mind of the subject is the utter despair and devastation that surrounds him. Another piece, which was featured in streetartnews, is done in the artist’s trademark stark, stenciled imagery. It shows the silhouettes of children riding an amusement park swing that is circling around one of the looming guard stations that punctuate the length of the West Bank barrier, which, upon completion, will be approximately 700 kilometers (430 miles). 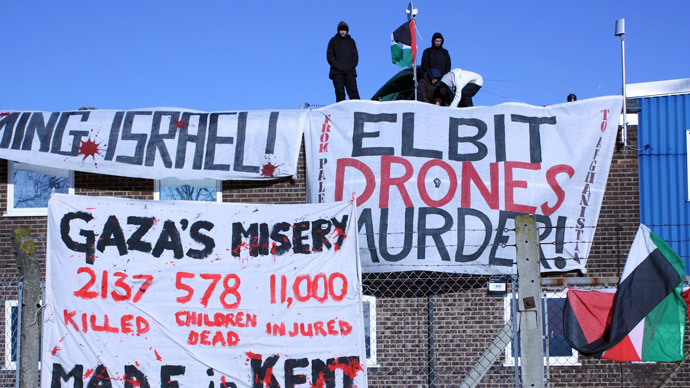 “Gaza is often described as 'the world's largest open air prison' because no one is allowed to enter or leave. But that seems a bit unfair to prisons – they don’t have their electricity and drinking water cut off randomly almost everyday,” Banksy said in a spray-painted statement. In another painting, in which a huge white kitten appears to toy with a ball of coiled metal in a field of rubble and debris, the artist is hurling criticism at the popular Internet meme involving felines, which attract so much social-media attention at the expense of more serious issues. In another place, Banksy offered some advice on a concrete wall: "If We Wash Our Hands Of The Conflict Between The Powerful And The Powerless We Side With The Powerful - We Don't Remain Neutral". Finally, the street artist provides a poignant statement in a 2-minute video, where he invites the viewers to "discover a new destination" this year, while providing a brief, yet unforgettable stroll through Gaza. Banksy, who is widely believed to be Robin Gunningham, an artist from Bristol’s underground art scene, has gone from the streets to the top of the art world. His first film, Exit Through the Gift Shop, labeled as "the world's first street art disaster movie", made its debut at the 2010 Sundance Film Festival. In 2014, he was awarded Person of the Year at the 2014 Webby Awards. On July 8, 2014, Israel launched a military operation, codenamed Operation Protective Edge in the Hamas-ruled Gaza Strip. What followed was seven weeks of bombardment, Palestinian rocket attacks, and ground fighting. 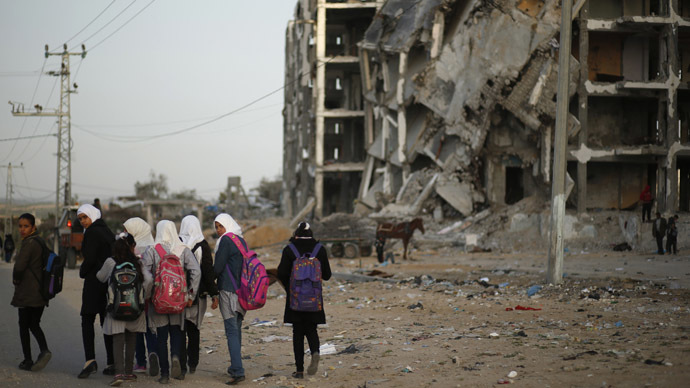 Over 2,200 people were killed in the conflict, the vast majority of them Gazans.